June is departing on a fabulous note - a warm, warm day followed by a long, calm and sultry evening. Although the sun has now set it's still warm now. This post will be short as I can feel myself glowing as my computer emits additional heat. The month though as a whole has been like May on the cool and windy side. Even earlier on today there was a fair old breeze swirling about, enough to make the rotary washing line swivel. My word or should I perhaps say phrase for the month is "back to front". I have a dahlia flowering before the first of the sweet peas has opened as much as a petal, which is most perturbing. I associate dahlias with late summer whilst sweet peas are high summer. Something has gone wrong somewhere! I think that is because I sowed my sweet peas later than I usually do so have made a note to get them in at least a week or two earlier next year. The sweet peas initially looked quite weak and almost anaemic but have responded to a seaweed based feed and are now quite robust plants. The garden has not received as much attention as it deserves this month as the allotment has consumed most of my time. I've been thinking quite seriously on this division and am slowly coming to the conclusion that something must give as I'm not doing justice to either. I'm thinking about enquiring about whether my plot could be split which would give me less to maintain. Something to decide perhaps not in the next month or two, but perhaps before the end of the year when my allotment rent is due. In the meantime apart from cursing the pernicious marestail which I swear I could knit with, I'm now enjoying the fruits of my labour. Our Wimbledon tennis viewing this afternoon was enriched by strawberries picked from the plot. Raspberries are now ripening along with the red currants whilst the other currants are not far behind. The gooseberry bushes are dripping. It looks as if there is going to be a good crop of apples this year. On the vegetable front I've picked the first courgettes. Beans and peas have just started to flower.The sweet corn and pumpkins seem to becoming on nicely. Potatoes have still to be harvested. The shallots are perhaps less productive than last year. All in all I've grown less variety than the last couple of years which again may be a reflection of trying to do too much as well as the result of deliberately sowing less. There have been a couple of plant purchases including the most tactile pennisetum orientale 'Karley Rose' as well as a geranium and a rose to be featured in another post. Going back to the garden I would be grateful if somebody would remind me to have an astrantia cull later in the year. You can have too much of a good thing. Thanks as always to Helen who enables to share our end of month reviews over at 'The Patient Gardener's Weblog'. I'm looking forward to seeing what everyone else has been up to in their gardens this June. - from 'A Midsummer Night's Dream' by William Shakespeare. The first of my scented plants this month is a rosa rubiginosa also known as sweet brier. When Shakespeare was writing it was known as eglantine. It's a wild rose bearing soft pink single flowers which are lightly scented but it's the foliage which is the more fragrant. If your grow this and should venture out on a warm wet summer evening your nostrils are likely to be assailed by the aroma of stewed apples floating through the air. The scent can also be detected on drier days by rubbing the slightly sticky leaves between the fingers. The arching branches can grow up to eight foot or so in height and it's a prickly customer. In the autumn and into early winter it's decorated with rose-red hips. I think that I must have bought this plant at a NGS open garden. I've never seen it for sale at a garden centre. It self-seeds gently and I'm always happy to share the seeds. I've got this plant growing both in the garden where it has unfortunately become rather straggly. My fault entirely for not being a more ruthless pruner. I've also got a more robust specimen at the allotment which started life as a seedling in the garden. My next door plot neighbour liked it so much that she asked for a seedling which is now thriving and is in flower over on her plot. My second plant is honeysuckle or lonicera which Shakespeare refers to as woodbine. The plant you can see above just appeared growing at the edge of the garden as well as in a second spot nestled in amongst a beech hedge. It is a climbing rather than a shrubby honeysuckle and although not certain of its identity I think is our native honeysuckle lonicera periclymenum. Although I've not tried I believe it is easily propagated by taking cuttings in early summer or by layering in spring or summer. The flowers are appreciated by both moths and bees. The scent takes me back to the garden of my childhood when a honeysuckle was planted in close proximity to my bedroom window. If I close my eyes I can smell the scent and hear my parent's voices as they worked in the garden on long summer evenings when we were tucked in bed. I must ask my sister if she can remember. There is also a honeysuckle on my allotment plot which I inherited. Its a shrubby one but I do not have a photograph of it but like those in the garden it seems to be resplendent with flowers this year. It seems to be a particularly good year for honeysuckles. Has anybody else noticed this? It's hardly surprising that Titania, the Queen Of The Fairies nodded off in such a delightful spot. I will be visiting 'Wellywoman' later to see what other June flowers might lull my senses and help me dream sweet dreams. Thanks to the lovely Louise for hosting. With the advent of the summer solstice yesterday dawn arrived slightly later today but in the garden rosa 'New Dawn' has still to attain her zenith. She has been in the garden for some twenty years or so and is in for the chop later this year. It's nothing personal but a small pantomime ensues every time himself walks through the archway with the lawn mower en route to the lawn. On one side a thorny rose brushes against him and on the other side a humulus lupulus aureus, aka golden hop clings to his legs. Not nice when you're wearing shorts is the complaint. Well that's putting it politely. The plan is if possible to replace both plants with more gentle touchy feely characters and if possible to save 'New Dawn' and replant her elsewhere. If she does not live to to tell the tale a replacement will probably be found as I'm most fond of her so are the bees. Sharing today's vase with this beautiful rose are campanula persificolia, astrantia, linaria purpurea, a penstemon (possibly 'Apple Blossom') and some frothy pink pimpinella major rosea. Although the weather is not acknowledging it here today (cool wind, rain, cool wind) summer is definitely here. I'm off to put the kettle on to warm my hands with a cuppa and then over to visit 'Rambling In The Garden' to see the glorious flowers which are no doubt gracing other vases this week. Garden Visiting ~ Windy Hall, Cumbria. "2 people, 4-acres, 6ft rain, 30+ gardening years" was the phrase from the NGS Yellow Book, which acted like a magnet for a visit to Windy Hall, just south of Bowness-on-Windermere in Cumbria last Sunday. 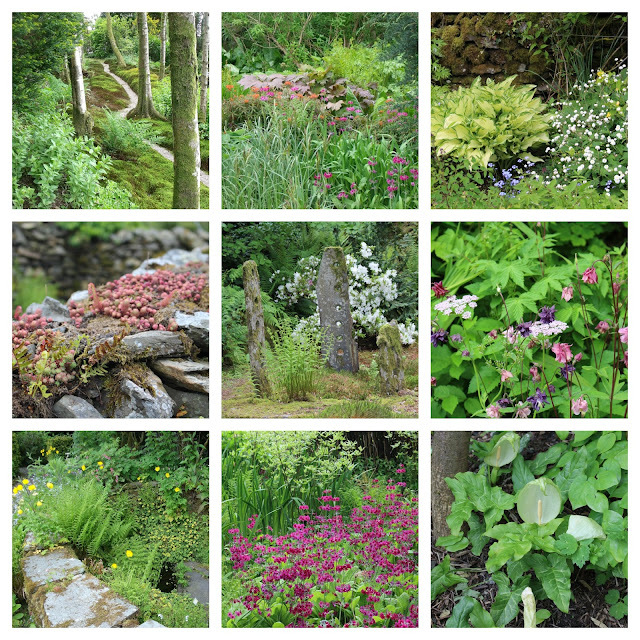 The fact that the garden is just a few miles down the road from the caravan was another reason why we could not miss out on a chance to visit. By one of those spooky coincidences 'Gardener's World' got there just before us so we were able to have a sneak preview of the garden on the Friday night before our visit. According to the friendly welcoming party the GW factor was swelling normal visitor numbers even at 10.45am. We were informed that the BBC crew had spent some 12 hours at the garden which resulted in just a few minutes coverage. With the aid of a well illustrated map we set off to explore the most tranquil and unmanicured of gardens. This is a garden where moss is celebrated rather than eradicated. There was certainly plenty to admire including the moss path (top left), the Japanese influenced quarry garden (above and below middle) and a waterfowl garden. The garden also has national collections of aruncus and filipendula. There was excellent cake we were informed and there were certainly lots of folk enjoying their elevenses. However as with alcohol never before lunch is my motto when it comes to cake so we resisted! A plant stall was a different matter with a visit being compulsory even before we set foot in the garden. I'm glad that I did as the geum avens 'Mai Tai' that I purchased was no longer on the sales table when it came to leaving. The highlight of the visit for me was a remark from himself who looking at a patch of flowers uttered the words "What are those lovely little blue fellows? I was that flabbergasted I can't remember what the flowers were. After 30+ garden visiting years I've finally converted him. Windy Hall opens under the NGS. Sadly both the 2015 dates are now done and dusted but the garden also opens to visitors by prior arrangement from April -August. Tree Following With Lucy ~ June 2015. All was looking most promising with my 'Doyenne du Comice' pear tree until towards the end of May/beginning of June. Firstly the rough weather at that time scattered a good number of would be pears to the ground. I presumed that was the phenomenon known as the 'June Drop' so just muttered to myself. What followed though has been more traumatic when closer inspection the other day revealed that some of the remaining fruits have the pear equivalent of the 'Black Death'. Not a pretty sight as you can see from above! Research revealed that the pear has been affected by pear midge. This is a pest which causes the fruitlets to turn black and fall prematurely. Apparently though I've not done this yet but if I cut up open one of the afflicted fruits it will reveal lots of tiny white grubs. The advice is to remove affected fruitlets before they fall to the ground or to spray with some nasty sounding chemical just before the blossom opens. So it looks as if this year's crop will be counted on two hands that is presuming all the other so far healthy fruits mature. I'm happy to report that the neighbouring pear has not been touched by the midge and although not exactly groaning with fruits it bears a couple of promising clusters one of which you can glimpse above. This fruit growing lark seems to be full of challenges but I remain optimistic that I will consume at least one of my own pears this year. Thanks as always to Lucy over at 'Loose and Leafy', who enables us to share the ups and downs of a fascinating and diverse range of trees each month. 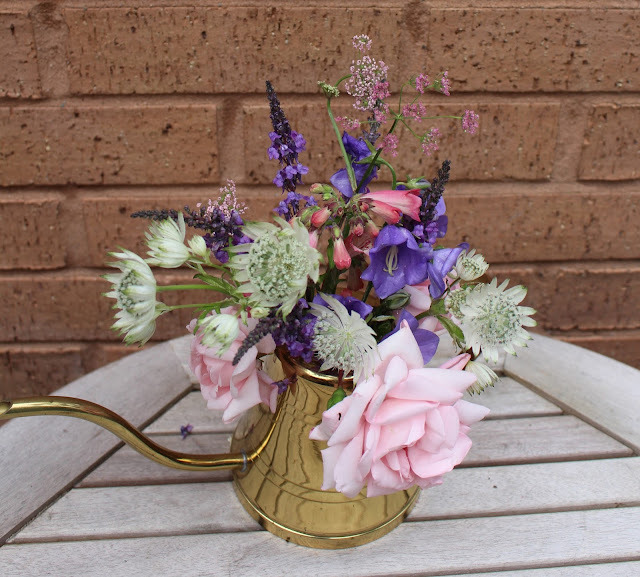 Today's 'In A Vase On Monday' is not quite as intended as a senior moment was responsible for me not picking a couple of planty bits and pieces at the allotment. I blame it on the heat. The larger watering can of the two belonged to my mother-in-law. It's been in a cupboard for some time but I've now realised that it's got vase potential so out it has come. The little watering can you can see in the second photo is usually resident on the Welsh dresser in the kitchen. The rabbit is supposed to Peter Rabbit hiding from Mr McGregor but those ears are a giveaway if ever there was one. Mathiasella bupleuroides 'Green Dream', which has really put on great growth this year and is after five years is probably getting too big for its allotted spot. The green bracts slowly flush pink as the season progresses. This umbellifer is native to Mexico but seems quite happy growing in north west England. Alchemilla mollis or 'Lady's Mantle' a favourite of mine despite its self-seeding habit. Scutelleria altisimma - I'm not sure where this plant came from and wonder if it arrived on its own accord. It has small blue and white hooded flowers just on one side of the stem. It beats alchemilla hands down for self-seeding so much so that I would not offer it to anybody. This plant or should I say colony of plants is in for the boot. Luzula - well I think it is anyway - it is a definite gatecrasher turning up uninvited some time ago but it is well behaved and considerate so has stayed. It's raining softly now so planned weeding is on hold. Instead a welcome cup of coffee calls and then a virtual voyage of discovery to see what other folk have in their vases this week, all thanks to Cathy over at 'Rambling In The Garden'. The flowers for this vase were mainly picked this morning before the predicted rain and gale force winds had the chance to materialise. It also gave me the opportunity to play about with the creative auto function on my camera. However the anticipated blurred background has not materialised as I imagined so it's back to the drawing board ..... yet again. Astrantia 'Gill Richardson', which is a deep red blood colour and decidedly more vigorous than 'Hadspen Blood' or 'Ruby Wedding' in my experience. An unamed astrantia major that's been in the garden for some considerable time. Aquilegia or 'Granny's Bonnet' - this is a descendant of the one of the very first flowers I grew from seed. If memory serves me well I obtained some seeds of aquilegia 'Hensol Harebell' from The Cottage Garden Society seed exchange. They have reliably reproduced every year since, some with purple rather than blue flowers and some doubles rather than the single form of the original plants. Polemonium caeruleum or 'Jacob's Ladder' which was also obtained from the seed exchange probably around the same time. It's later than usual this year with the flowers still to open properly. Like the aquilegia it seeds itself gently about. I also have a couple of named polemoniums "Lambrook Mauve' and 'Sonia's Bluebell' but this form is my favourite. Cerinthe major purpurescens - a self seeder in this case which appeared in the gravel last autumn just below the flower bed, where one or two plants had flowered in the summer. The fluffy pink spikes are persicaria bistorta 'superba', formerly known by the slightly naughty but most memorable name of polygonum bistortum 'Superbum'. Anthriscus sylvestris or cow parsley - I picked some errant stems from the gabion border where a couple of plants have seeded themselves. They are due for removal imminently.This plant dominates both sides of the lane leading to where we live in May as well as the uncultivated land behind us. As pretty and ethereal as it is cow parsley is becoming a bit of a thug. This article which describes it as 'a countryside killer' makes for thought provoking reading. Finally some foliage interest from last week's discarded vase. Foeniculum vulgare or fennel both the green leaved and bronze forms, which were plunged into water did perk up the next day although they still remained on the floppy side. I came to the conclusion that that's perhaps just the nature of the beast. It's one of the most tactile plants I know and emits a delicious aniseedy fragrance when you stroke the leaves. As usual my vase followed me around the house as I snipped. I'm getting more and more pleasure from this meme as the weeks go on. I will probably remain a 'plonker' rather than an arranger as I'm quite ham fisted and impatient when it comes to completing fiddly tasks with my hands but you never know! Thanks to the lovely Cathy over at 'Rambling In The Garden' for hosting so encouragingly each Monday.